Tournament Player Sponsorship: Join TEAM TIER ONE today! Junior tennis development is an important part for the continuous growth of this great sport. We are excited to offer junior and adult tournament players discount/sponsorship opportunities. Becoming part of the ever-growing TEAM TIER ONE is easy. Just fill out our online application form to find out your exact discount/sponsorship opportunity. And yes, we do have some of the highest rated tennis strings in the tennis industry!!! Help us get to know you! Please submit the form below. Providing us with the most accurate information will help to make the right decision. If yes, who are your current sponsors? For which type of products do you currently have a sponsorship? Tier One Sports String would you like to play? What is your current ranking in your age group? Players who are ranked Top 50 in their respective country. Players who have an ITF ranking. Discounted string reel purchases for players who consistently participate in open level tournaments. Players who are ranked Top 20 in their respective country. 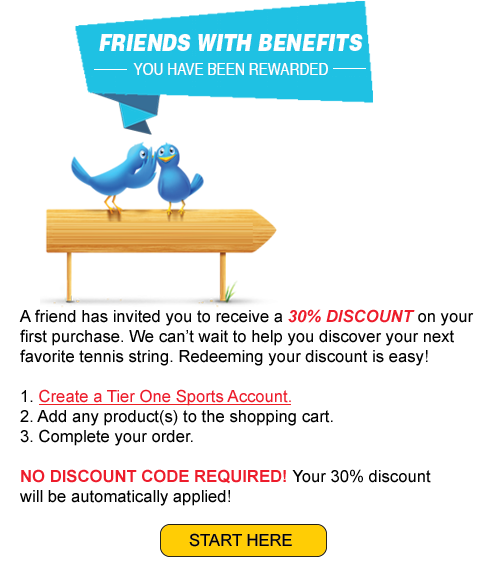 Tell your tennis friends about it!